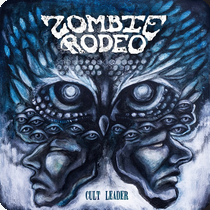 Zombie Rodeo is a Finnish, Helsinki gritty fuzz based rock band. The band is now releasing a brand new EP named Cult Leader, through Inverse Records on 18th November 2016. This time Both the music and vocals are much tighter and pronounced, than previous releases With the, with a more heavy, melodic and diverse feeling. Even the band were very positively surprised Themselves by the outcome. Now Zombie Rodeo is ready to spread the music and to perform energetic and loud live performances. Zombie Rodeo is a Finnish, Helsinki based gritty fuzz rock band. The band is now releasing a brand new EP named Cult Leader, through Inverse Records on 18th November 2016. This time both the music and vocals are much tighter and pronounced, than with the previous releases, with a more heavy, melodic and diverse feeling. Even the band themselves were very positively surprised by the outcome. Now Zombie Rodeo is ready to spread the music and to perform energetic and loud live performances.